You can re-direct emails from your other mail boxes to your Yandex mailbox. Note. Up to 10 importers can be created in one mailbox. Go to All settings → Import mail from other accounts. In the Import mail from block, enter the username and password that you use to log in to the other mailbox. Then click Turn importer on. Note. If you not only want to get your messages from another mailbox, but also send messages in Yandex using your other username, then enter the complete email address (for example cheshire.katze@forestmail.com). You'll get a confirmation message after you've successfully set up mail forwarding. Then you can set message filters for your forwarded mail (i.e. label them and sort them into folders). Go to Your mail server settings . Enter the name of the mail server and port number manually. You can get the values of these parameters by contacting customer support at your other mail service. The first email import will happen within a few minutes after you set up the mail importer. After that, the time it will take to periodically collect your emails from the other mail server can be anywhere from 10 minutes to a few hours (depending on the server). You can't set or change this parameter. Go All settings → Import mail from other accounts. Click on the name of the mail importer in the list of connected mailboxes. Click Options. There you can edit filters for imported emails and the parameters for connecting to the server. To disable mail import, go to the Mail import page and click disable. If the mail importer is no longer needed, click on the name, then click Delete. If you want to collect emails from another Yandex mail box, you can customize a mail forwarding rule in this mailbox. After you confirm the rule, all new emails will be transferred to your current mailbox. Log in to the mailbox you want to collect emails from. 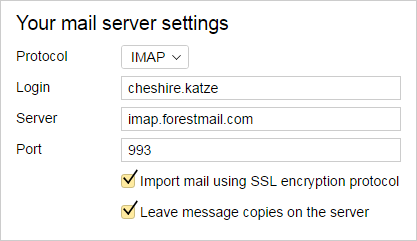 Click Email clients and select From the imap.yandex.com server via the IMAP protocol. Click Save changes (the button appears after you select new entries or deselect other entries on the list). Create an importer for your current mailbox. If you set up a mail forwarding rule, disable the mail importer once all your old emails have been forwarded. Otherwise, your emails will arrive at your new mailbox in duplicate. You can also disable the forwarding rule and only keep the importer. This troubleshooting guide will help you resolve issues related to mail importing. Before you start, open Yandex.Mail in a new tab to follow the recommendations.